Eat Your City: Apple pie cinnamon goodness oatmeal recipe - part 6 of Breakfast and Brunch series! 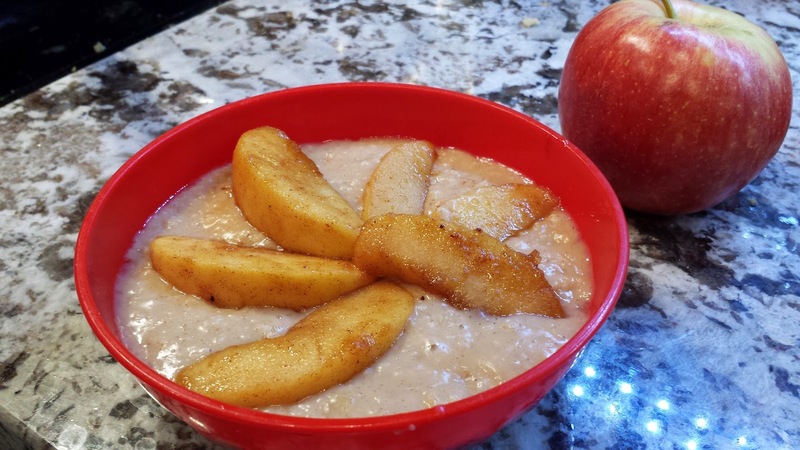 Apple pie cinnamon goodness oatmeal recipe - part 6 of Breakfast and Brunch series! Its healthy, its breakfast.. it tastes like a dessert?! I used to love oatmeal when I was a kid.. ate it every day for breakfast, and sometimes even for lunch or dinner. My mom made a savory version not sweet and I had it day in day out... until one day I made a connection that hey.., salty oatmeal as the consistency of snot. HAHAHAHA!! So, it was years before I was able to touch oatmeal again - and it was in this almost dessert like form. My boyfriend loves digging out apple filling of pies, tarts, strudels... and I didn't want to just make him the apple cinnamony goodness filling without making it healthy somehow.. and one day I had bags of apples to use up... so this recipe was born... alot of apples, a bit of cinnamon, a kiss of brown sugar, nutmeg and oatmeal for an apple pie cinnamon goodness oatmeal recipe. Feel free to add even more apples - I made this once with 3 bags (over a dozen apples) and I just added a smidge more brown sugar at the end. Save yourself a lot of work by using an apple peeler to quickly peel all the lovely apples for this recipe. Part 4: how to make Oven roasted garlic and herb crispy potato wedges with bacon! Part 5: Stuffed sweet and savory French Toast! 1) In a large bowl, place 2 cups of water and the oatmeal in it to soak. Go peel and cut up apples. 2) In a large nonstick deep pan or wok, toss 0.5 tablespoons cinnamon, 1/4 teaspoon nutmeg, butter, all the apples and the brown sugar together over medium heat and cook, stirring every now and then for about 10minutes until all the apples are nice and soft. Spoon out about 1/2 the apple mixture and reserve. 3) Add in the pre-soaked oatmeal to the pan/wok holding the apple mixture, cook on medium high for a few minutes until oatmeal is cooked through (2-3 min for instant/quick oats, more if its the other longer cooking types). Add extra water to thin if needed to make it the consistency you prefer. Add extra brown sugar to taste. 5) Divide up into bowls or tupperware (if saving for next day's breakfast) and top with reserved caramelized apples. Enjoy! It must taste great! Thanks for your tips! Thanks Crystal! I usually make a huge batch and then have it for an easy breakfast for the next few days :) Enjoy!